Medical Ceramics have non-toxic nature and high mechanical strength, in addition with negligible or no tissue reaction which render them to be used in medical applications. Traditionally, ceramics have seen widescale use as restorative materials in dentistry and some ceramic materials are used for joint replacement, bone repair and augmentation. Goldstein Research analyst forecast the Medical Ceramics Market size is set to reach USD 7.67 billion by 2024, at a CAGR of 6.25% over the forecast years. The report covers the present ground scenario and the future growth prospects of the Medical Ceramics Market for 2016-2024 along with the adoption rate of Medical Ceramics in the verticals and the data related to innovations in the field of Medical Ceramics. We calculated the market size and revenue share on the basis of revenue generated from major players across the globe. On the basis of type, bio-active lead the medical ceramics market with 30% market share as aluminum oxide is the most consumed medical ceramic for implants and medical devices while glass and bioglass are used for disposable and packaging. Piezo- and bio-resorbable ceramics are anticipated to have the potential growth at a CAGR of 6.55% in near future owing to the increased adoption in medical devices and implantable devices. Medical Ceramics Market Outlook 2016-2024, has been prepared based on an in-depth market analysis from industry experts. The report covers the competitive landscape and current position of major players in the global Medical Ceramics Market. The report also includes porter’s five force model, SWOT analysis, company profiling, business strategies of market players and their business models. Global Medical Ceramics Market report also recognizes value chain analysis to understand the cost differentiation to provide competitive advantage to the existing and new entry players. 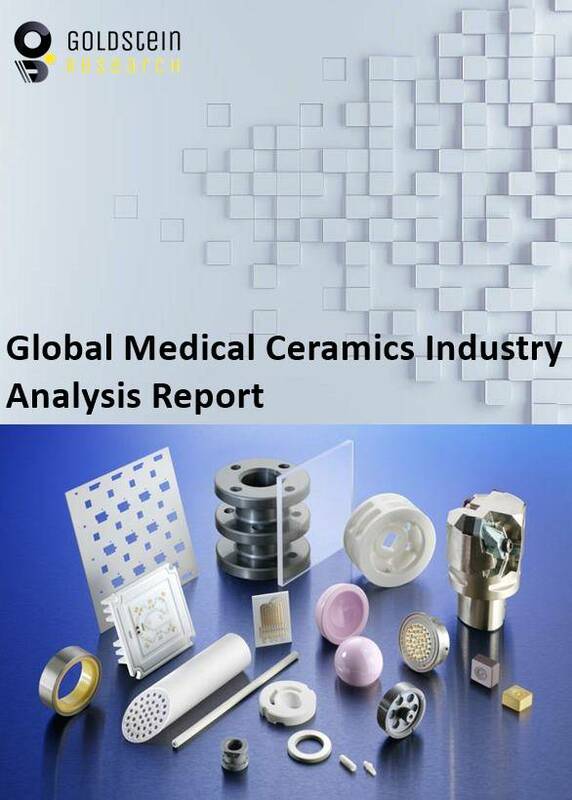 Our global Medical Ceramics Market report comprises of the following companies as the key players: 3M ESPE, Advanced Cerametrics Inc., Advanced Monolythic Ceramics, Inc., Advanced Ceramics Research, Inc., AVX Corporation, APC International Ltd., and Advanced Industrial Ceramics. According to the report, major driving factor for Medical Ceramics Market is sales of medical implants and devices due to increase in number of patients worldwide opting for dental implants and joint reconstruction surgeries. According to the American Academy of Implant Dentistry, approximately 3 million people have dental implants, which are growing by 500,000 every year. Further, the report states the major challenge that is although medical ceramics are known to be nontoxic, there are cases where very small traces of radioelements are found even in the ceramics that are fully refined and as even the trace amount of radioelements can cause harmful effects on tissues and organs. Based on geography, United States was the largest medical ceramics market in 2016 with the market share of 30% among all the regions while APAC offers lucrative opportunities in the medical ceramics market as China and India are densely populated and have the high demand of orthopedic implants due to their high resistance and biochemical inertness. APAC also tends to grow at the highest rate over the forecast period due to the presence of high unmet medical needs and constantly improving healthcare infrastructure. What is the revenue of Medical Ceramics in 2015-16 and what would be the expected demand over the forecast period?